The way the projects were formulated indeed suggested that tracking projects was not given much importance. All organizations seemed to do everything everywhere, with no statement of clear outcomes in terms of the particular activities that would benefit particular groups of people in particular areas. They also did the same thing under different headings, as for instance providing food for school children under education and nutrition and food, while enormous amounts seemed to be used for what was termed capacity building. This does not necessarily mean that funds went astray, but it certainly meant that monitoring was impossible. Meanwhile, though we had been told that the whole point of the CHAP was that OCHA coordinated the work, some organizations did not bother to provide reports to OCHA on the grounds that the funds they had received had been provided independently. Perhaps the best comment on what was done with all this was provided by the former Head of Forut, of blessed memory, who is reported to have declared, when asked what had been done with all the money spent on capacity building, that the peasants of Kilinochchi and Mullaitivu had been taught to boil water before drinking it. To get back to 2008, and plans for CHAP 2009, we insisted that year that any projects had to be agreed with government, and that the relevant line ministries should participate in project formulation from the start. Rather grudgingly invitations were extended to our Ministry and the Foreign Ministry for the initial meeting with Vavuniya, but I passed on the information to other Ministries too and requested them to send representatives. Of course it was too late. Sometime last year I was told by a representative of the UN that we had won our point, but the sad truth is that nothing of the sort had happened. All we had achieved was that OCHA had granted that in theory the CHAP was accountable to government. In fact there was no accountability in practice, even though the Head of OCHA did genuinely try, albeit with delays and not always with success, to answer any queries we advanced. In 2008, there had been efforts to insist that CHAP was above government. I am indebted to our Human Rights Consultant at the Ministry for noting, after we had at least got more consultation of all relevant Ministries in Colombo, that what was meant to be the final version of the CHAP indicated that this would be administered by the Inter Agency Standing Committee. This was a shadowy entity, which we had repeatedly asked the Foreign Ministry to investigate. We were finally told by an earlier Secretary to the Ministry that it had been set up in 2006, and was another initiative of the first Senior Adviser to the High Commissioner for Human Rights, an individual who probably did more to traduce Human Rights in Sri Lanka than any other, in terms of the destructive impact he had on our Human Rights Commission, the International Independent Group of Eminent Persons and, as I now found out, humanitarian operations in general. We were told by OCHA that CHAP belonged statutorily to the IASC, in terms of a decision of the UN General Assembly. Fortunately I had done my homework, and was able to point out that the IASC was a body that had been set up in New York, to coordinate work between the UN and other major agencies, such as IOM and the Red Cross. Any attempt to introduce such a structure at country level was simply a proposal of OCHA which did not have General Assembly ratification. Furthermore, the OCHA proposal was that a country IASC could have one or possibly two NGOs, whereas what had been set up in Sri Lanka included practically all foreign NGOs. It was these NGOs that, around August 2008, set themselves up as the Coffee Club, apparently to leave out of their deliberations the local NGOs that were supposed to be part of the IASC. That was fortunate for us, since this focused attention not only on the machinations of the Coffee Club, but also the IASC itself, which had already been noted for issuing statements that could be used to critique the Sri Lankan government. 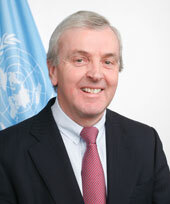 I had drawn attention to this a year earlier and, though I could not persuade Sir John Holmes, the Head of OCHA in New York, that IASC reports should not include political content, he had admitted that they should be balanced – and sure enough, the following week, having ignored problems in LTTE controlled areas previously, the IASC report noted continuing tensions there. By 2008 the Coffee Club had geared itself to trying to stop the progress of the Sri Lankan forces. For this purpose they prepared a statement which they delivered to the UN Secretary General, one of the first shots in the saga of misinformation provided to him. The text was largely prepared in London, by a shadowy figure called Peter Bowling, who was supposed to be sympathetic to the LTTE according to staff at our High Commission. It had been discussed with, amongst others, Yolanda Foster of Amnesty International, who had served a stint in Sri Lanka at the International Centre for Ethnic Studies, and Alan Keenan of the International Crisis Group, who was still in Colombo and also associated with the ICES group. However, the decision of the Coffee Club was to present the petition as that of local Non-Governmental Organizations, not the humanitarian agencies which they felt did not share their agenda, but the advocacy ones. Fortunately, perhaps because we had been able to highlight the conspiracy, the Secretary General did not act on the petition, though Radhika Coomaraswamy confirmed to me that it had indeed been delivered. However such a petition, alleging appalling deeds by the Government, must have had its effect, and perhaps contributed to the first mention of War Crimes by the Secretary General in a statement in September. In that sense we can see his current concerns as according with an agenda that was being prepared many months back. We need to be aware then that the current campaign is nothing new, but something that has long been brewing through the efforts of a very large collection of individuals and institutions. That awareness will I trust help us to deal with such threats more successfully.